I’m back from Transylvania and I just had to share with you my favorite food discovery! We ate these kurtoskalacs twice and I wish I would have had a chance to eat them a few more times! 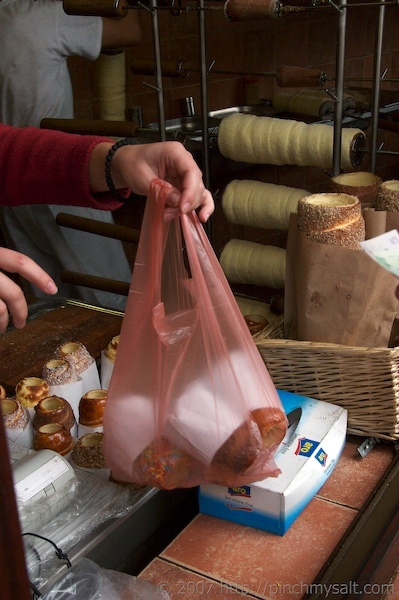 Kurtoskalacs are a traditional Hungarian pastry and, depending on who you talk to, they are the oldest Hungarian pastry. History and Geography are two of my worst subjects but Transylvania, which is now part of Romania, was once part of Hungary. Or something like that. Anyway, there is still a sizable Hungarian population in Transylvania and these yummy kurtoskalacs, which I believe originate from Transylvania, are widely available. So here’s what I was able to determine after eating some of these tasty Transylvanian treats and watching part of the assembly process. They are made with a yeasted dough, similar to a sweet roll dough. 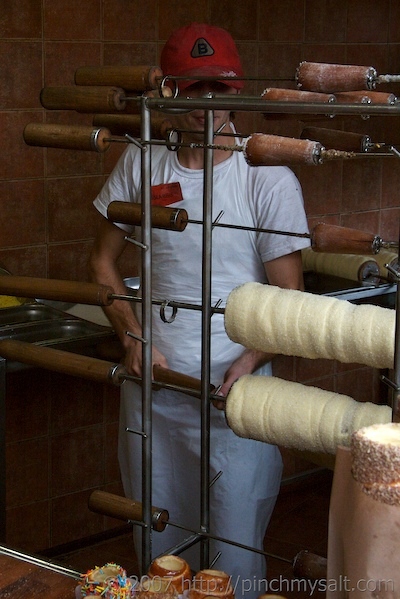 The dough is rolled or cut into long strips and then wrapped around a cylindrical mold. Then it gets brushed with oil and rolled in sugar. Now for the interesting part. They get cooked over open coals, kind of like the way we roast marshmallows. 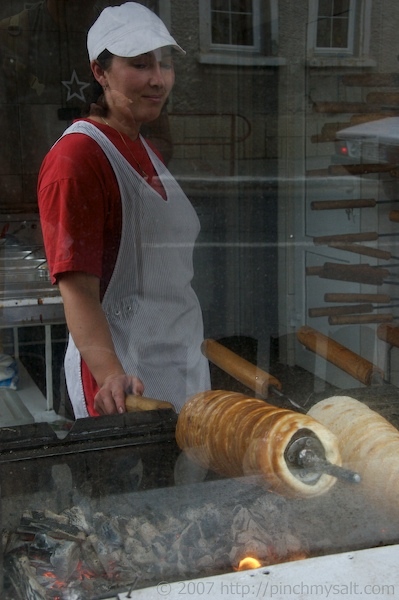 The spirals of dough are watched carefully and turned so that each part gets evenly browned. When they are perfectly caramelized, they are taken off the coals and rolled in a topping such as crushed nuts, cinnamon, coconut or colored sprinkles. They don’t have to be rolled in the additional topping, it’s up to you. They taste great with just the plain caramelized sugar glaze! They also sell them in a smaller size. The small ones are great if you want to sample a few different flavors at once. 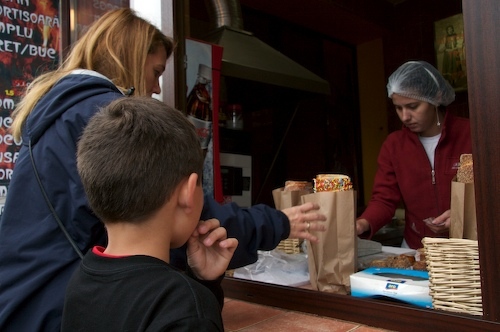 The first time we visited the kurtoskalacs stand, we bought the small ones and sampled three different flavors: coconut, cinnamon, and pecan. They were all great but I think I liked coconut the best. Our friends tried one with sesame seeds and loved it! The second time we visited the kurtoskalacs stand, I decided I had to get a large one. This time we tried it plain and I think it was my overall favorite. The sugar coating is just right…not too crunchy and not too sticky. And the bread is light and airy with a texture that reminded me of the inside of a glazed donut. But my favorite thing about kurtoskalacs is the way they unravel as you eat them! Since I wasn’t able to get photos of the bakers rolling the pastry dough onto the molds, I decided to see if anyone had posted a kurtoskalacs video on the Web. Sure enough, one of my favorite bloggers has a great little video clip of the kurtoskalacs being made. Go visit Ms. Adventures in Italy to check it out. I also found that another one of my favorite foodbloggers has some experience with kurtoskalacs! Check out the photos and description at Habeas Brulee. As for the rest of my Transylvanian adventures, you can check out my photos on Flickr. I have only uploaded about half of them but the rest should be up by tomorrow. 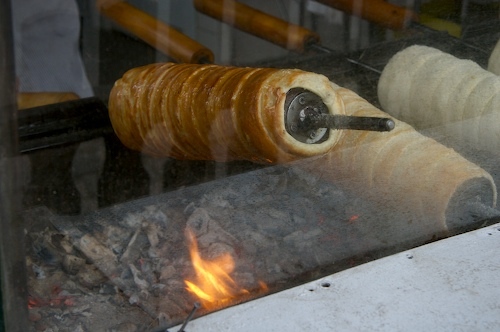 These look and sound great... All the caramelization with lots of exterior.. I love the open coals thing; anything grilled has to be good!Nice photos. I'm ready to try one! I would LOVE to try this Nicole. I love sweet bread and what a fascinating way to make it! Thanks for the thorough descriptions and photos. I would like my order plain, they way you ate it! Yum, cinnamon was my favorite, but they didn't have coconut, so that's a must-try! I liked that it wasn't completely sweet (the bread) so you could just keep unrolling it and scarfing it down. :)I can't wait to see more Transylvanian pics...what were you doing there? As always, I enjoyed your photos. I especially liked the one of the old woman sitting on the bench with the flowers! The kurtoskalacs looked so yummy. Thanks for sharing your experience. Great find...there ARE foods out there yet to be discovered! Oh my GOSH those look delicious. Hmm, maybe I should go eat lunch. Glad you're home safely! The kurtoskalacs look amazing, Nicole. And you look quite happy unraveling that one. Do they have a smoky taste at all, being cooked over open coals? Oh, yeah. And welcome back! You've been quite the vagabond of late. Kind of like a fruit roll up or "fruit by the foot," except it's not sugary fruit, but sugary bread. I dare you to make those. I am wondering how I could do that. Sounds so good, and I am with you, I think that just sugar would be best.By the way, do they celebrate Halloween in Transylvania? By the way, don't forget to purchase a Radioactive Kangaroo shirt. You know you want one. Nicole - This is my first "trip" to your blog, and what a delicious way to start! I love traveling, and my grandmother was from Transylvania! (No, not REALLY a vampire!) ;-) I've never heard of these pastries, though. Unfortunately, she didn't bring this recipe with her and make it a part of our family tradition. Too bad, because they look like they'd be fun to unravel and eat! Toni: So glad you stopped by because now I've discovered your wonderful blog! 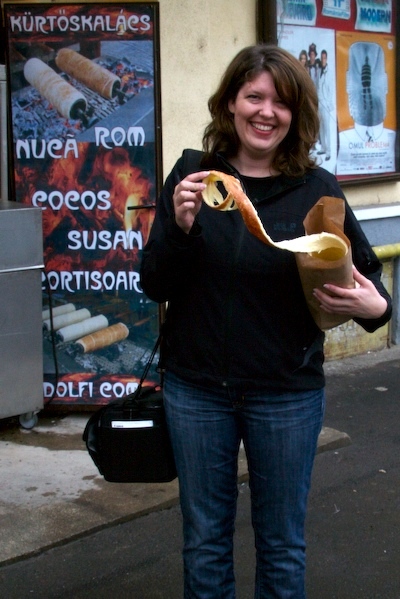 Maybe you know a little about the yummy 'sour soups' that I ate while in Transylvania? Aren't they good? Dave and I had so much fun eating them when we wandered around fairs in Hungary!There's actually a book about a Hungarian/Transylvanian bank robber that you might like, which talks a bit about Transylvania's nationality issues. Fascinating! I've been pouring through some 'ethnic' cookbooks and find myself continuously saying, They did THAT with yeast and flour and a handful of other ingredients. Amazing stuff, yeast. And ingenuity. how wonderful. not only did i get to dicover your blog but you have also posted on one of my all time favorite sweets from transylvania. i am personally from brasov, but now in belgium so these have become a rare delicacy. we drive on purpose to one of those street vendors every time i am home :) delicious! You can find information of baking, ovens, bussiness. Visit http://kurtoskalacshungary.hu for more. I'm portuguese and I was in Transylvania a few weeks ago. I ate kurtoskalacs by Lacu Rosu, it is DELICIOUS! Does anyone knows the recipe? I just stumbled upon your blog when I was looking these things up, trying to figure out what they were. I saw them being cooked on the Chain Bridge over the Danube in Budapest this last weekend and was wild to find out what they were. Unfortunately, I didn't try one. Shame. Great to see these. I have just come back from Budapest and saw them being made in the Christmas market. After a busy day sightseeing our party were looking forward to trying some as pudding after eating the deliceous savoury outdoor food. Unfortunately we left it too late and the stall was closed, we were all so disappointed. All the other pastries I ate in Hungary were the best I have ever eaten. Anyone, like Faith, still able to give us this recipe? I really would love it! Guess what I found: A Recipe for Kurtoskalacs! Here we go: (Transylvanian Milk Bread Rings)6 egg yolks 100-120 g/4-4 oz. butter tsp. salt 2 tbsp.sugar 50 g/2 oz. yeast 500 ml/18 fl. oz. lukewarm milk 1,000g/2 lb. flour sugar chopped almondsDissolve the yeast in the lukewarm mild. Beat the egg yolks and butter together, then add the salt and sugar. Sieve the flour and add the egg mixture and the yeast. Blend together thoroughly. Cover with a cloth and put in a warm place to rise. Turn out onto a floured surface, roll out and cut into long strips – 5 cm/2 in. wide. An alternative way is to divide the dough into small balls, leave to rise and then roll each ball into long strips, 5 cm/2 in. wide. Brush the rolling pin with melted butter and twist the strips, one at a time, on to the pin. Press together with the fingers so that the edges nearly meet. Brush with melted butter and sprinkle with roughly chopped almonds and sugar. Bake over an open fire, turning constantly until golden brown, or in an infrared oven. They can also be baked in an ordinary oven, but in this case bake without the almond and sugar coating. Remove from the oven when half-cooked and brush with more melted butter and then sprinkle with the almonds and sugar. Finish baking. kurtoskalacs sound great. any chance i could find them in boston massachusetts? email me soon. 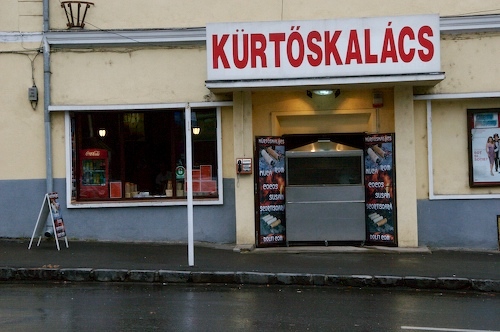 I wish I could go to Transylvania and eat those delicious kurtoskalacs! Hi, Anne, Take a lookj at several messages above yours and you will see a recipe that I posted. Has anyone tried it, yet? Hi Lynda thanks a bunch for the recipe, I`ll try it and let you know how well I didI have some maps of transylvania for $10.00, 1:500.000, about 40x30 " in size, one can see the names of locations rumanian-hungarian :Motorway, International maim road,National main road, Important connecting road, other road. dirt road, Frontier crossing, Airport, Filling stations, HOTEL MOTEL, HOSTEL, Camping site, spa,ect. ect.,ect,.Later, Anne. ive loved these cakes and developed a mobile business making and selling these cakes in the south but due to a heart problem i cant carry on.anyone interested in buying this business the first in the uk call 07948718101.ive got everything from hobart mixer,gazebo,generator 6kw,table all ready to work.have done 3 markets only response excellent profit margin unbelieveable. Please tell me what kind of wood do I have to use in making the mold. Thank you in advance. Hi Steve: I am from Quito, Ecuador, South America and want to start my business selling these yummy cakes that I tried three years ago in Budapest. Would you please tell what type of wood do I have to used in making the molds? any advice on the business will be appreciated. Hi everyone! I know for sure how good is the Kürtös Kalács, I've been practically raised wit it reason why I wanted to start a business. Due to a family problem I could not put it on track so I have to sell the machines. If anyone is interested, it is a very good business indeed, I can provide you a new, full set of electrical machines, recipes and any informations you may need. You can contact me at dianamester@yahoo.com. We have helped many vendors around the world, learn how to make this wonderful product. You can learn more about us and our products and training by checking out our web site. This blog is a great introduction to the wonderful Kurtoskalacs.. well done!